The haze stretches from the foothills of the Sierra Nevada mountain range to Sacramento and hovers over the San Francisco Bay Area, with most major population centers in between suffering air quality that’s considered dangerous for children, the elderly and people with asthma or other respiratory conditions. The skies cleared a bit Wednesday in Utah’s capital city, but more smoke is expected to blow in over the weekend, National Weather Service meteorologist Steve Rogowski said. Thursday marked the Sacramento region’s 14th straight “Spare the Air” day, when people are encouraged not to drive and add further pollutants to the air — the longest stretch since at least 2001. A similar warning is effect in the San Francisco Bay Area, and air quality experts in California’s Central Valley and areas southeast of Los Angeles are warning residents to limit outdoor exposure because of wildfires. “It doesn’t seem like it’s sustainable to have this happening year after year after year,” she said. “Normally that doesn’t happen on a regular day at camp,” said Jay Lowden, president of the YMCA for a nine-county region that serves more than 700 kids weekly at 13 summer camps. 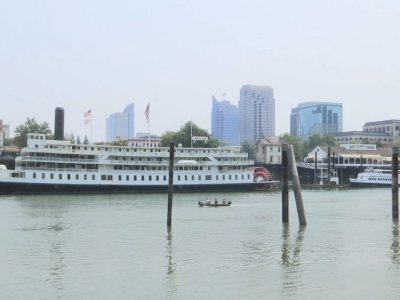 Because the city is located in a valley, it’s easier for smoky air to get trapped when high pressure systems blow in, making Sacramento like a smoke-filled bowl that’s had a lid placed tightly on top.